The Straw Hat Pizza Cooperative announced today that it was implementing a voter registration program to encourage it’s many younger guests to participate in this year’s presidential election. Participating Straw Hat locations are displaying voter registration messages and supplying voter registration forms to anyone who hasn’t yet registered. 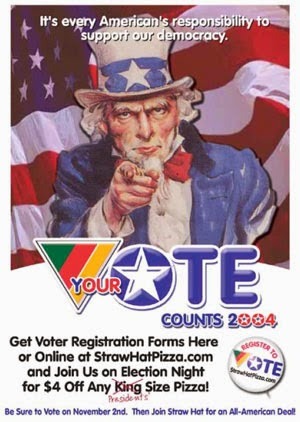 The company is also encouraging voter registration through their website, StrawHatPizza.com. Additionally, locations have temporarily renamed the brand’s signature “King Size” pizza and are offering $4 off any “Presidents’” size pizza on election night, November 2nd. “I think any time the message gets out about how important it is to vote is a great thing.” said Joshua Richman, president of Straw Hat, “We view this effort as a natural continuation of our other community based programs, something Straw Hat has long been proud of.” “Whatever the outcome of the election, our democracy is strengthened when more Americans vote” said Richman. Straw Hat plans to emphasize the program by decorating their locations in election paraphernalia and several locations plan election night parties, including big screen election news coverage in the dining rooms. The Straw Hat Pizza Cooperative announced today that Allen Strege is returning to Straw Hat Pizza as the Company’s Northern Area Director. An industry veteran skilled in restaurant development, Strege oversaw several Straw Hat locations during the Company’s rapid growth of the 1970’s and operated eight Chuck E. Cheese locations in that company’s early days. Strege was also part of the concept development team for Max Sportster Restaurants and developed a successful resort-dining concept in California. Straw Hat Pizza has recently re-energized its 44-year-old concept by introducing a new design and décor package, expanded menu offerings, improved service and training formats, and an advanced marketing program. The company has also implemented a new development plan, hoping to attract young entrepreneurs with its unique business opportunity and cooperative advantages.